You are winding your way through the maze, considering your options, bracing yourself for what’s around the bend. Your world has become very small and uncertain. Its contents are the mottled brown and gold corn on either side of you, the line of sky above, and the thrill of your next decision. When you enter the cornfield to lose yourself each fall, you become part of a story old as the pyramids – the first maze, then called a labyrinth, was constructed by ancient Egyptians to be travelled as a spiritual journey. Since then, cultures have used mazes for religious observance, storytelling, and recreation. The corn maze, however, is a modern phenomenon. Don Frantz is credited with the creation of the first corn maze, the dinosaur-themed “Amazing Maize Maze” which was grown in 1993 in Pennsylvania. 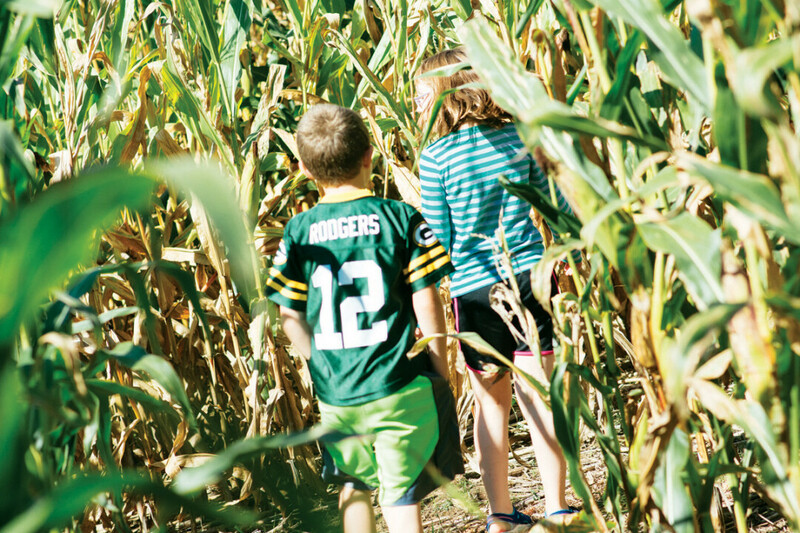 Govin’s Meats and Berries in Menomonie has been running an annual corn maze for nine years. 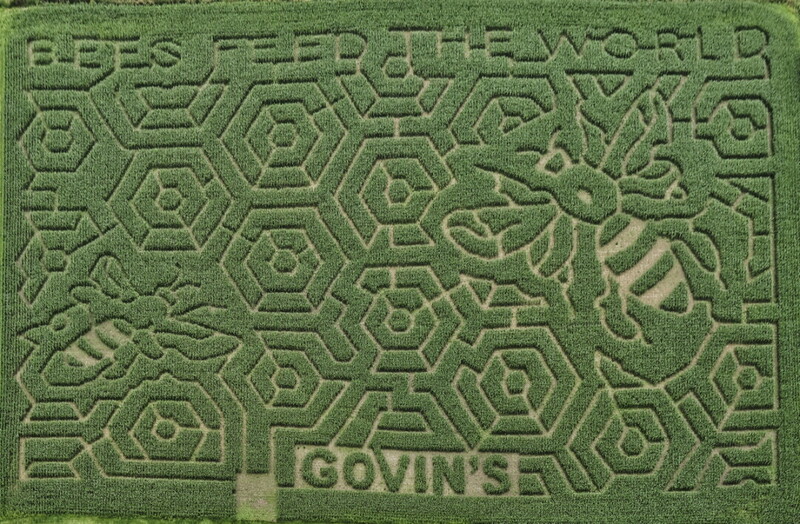 John Govin and his family come up with the theme – which has ranged from football to bees – and hire The MAiZE Company, a Utah-based corn maze design firm, to cut their 11-acre field. Corn mazes are a big source of income for agro-tourism farms, according to Govin. They also let families reconnect with agriculture. Govin said that when he was a child in the ’60s, the average family was three generations separated from agriculture, and now, in his 50s, the average family is five generations separated. Farms that specialize in events and community participation through corn mazes, pumpkin patches, and hayrides are at the mercy of the weather. When it rains or gets too cold, traffic slows or stops entirely, gouging revenue. This means that while traffic-based farm businesses can be highly profitable, they can also be a big risk should the Chippewa Valley face a rainy autumn. Since the first corn mazes were cut in the U.S., their popularity has grown exponentially; hundreds of them are grown annually in the United States alone. Nine are within reasonable driving distance for a family outing. Some mazes are drawn freehand, while others are created using special design software. The image is plugged into a GPS mapping program which can be used with a mobile device. Corn mazes are “cross planted.” This means that they are planted in rows that run north to south, and then planted again in rows that run east to west. This makes the field dense and harder to see through. When the corn has sprouted and grown to 6”-10”, the design is cut into the field. Larger operations use GPS-equipped tractors to cut, while smaller ones use a riding lawnmower and a GPS-based cell phone app. Some mazes are even cut by hand. While the remaining corn grows, the paths are maintained through regular mowing and mulching. This prevents other plants from taking over the walkway. Come fall, farms open the maze to fun lovers of all ages. ➜ Corn mazes are usually grown using feed corn or sorghum, which can be harvested and sold or used as livestock feed. ➜ Early corn mazes were cut after the corn had grown tall using a weed whacker or similar tool. Small operations who choose not to use adapted technology make their designs life-sized by marking their field like graph paper and mowing the paths section by section. ➜ Some mazes feature bonus fun. Designers organize trivia checkpoints, scavenger hunts, and more to help people explore the maze more fully. ➜ Although results vary by farm, corn mazes can yield some of the highest profits per acre of any crop.